Nearly three years ago, while showcasing what we now know was a game that had barely even started development, the people behind Final Fantasy XV demonstrated a flashy fight between the hero Noctis and a Final Fantasy stalwart, the hulking Iron Giant. We only got bits and pieces of the battle, but what we saw looked spectacular. Noctis rolled and zipped around a giant city plaza, sparks flying as he hacked apart the enemy soldiers that surrounded the Giant. He’d throw his sword at a building and warp wherever it landed, allowing for some aerial acrobatics that put even sister series Kingdom Hearts to shame. In the trailers and gameplay footage that would follow, the battle with the Iron Giant appeared pretty frequently. It appeared to be one of the few things Final Fantasy XV’s dev team had actually finished. Three years later, thanks to the new FFXV Platinum demo, we can finally play that dazzling fight. It’s the climax of a 30-minute adventure that takes Noctis through a surreal dreamscape that feels very much like a Final Fantasy game, complete with stellar music, weird humor, and astounding scale. Although the demo launched back on March 30, after the FFXV Uncovered event, I was out of the country and didn’t get a chance to play until this past weekend. To compensate, I beat it twice. There’s quite a bit to complain about, I should say. The framerate takes some heavy hits whenever you use magic, and the camera is a nightmare, especially when Noctis is trying to navigate the movable big toy blocks that litter the second stage. The whole “defend” function still doesn’t make much sense—there’s little point in using it—and it’s kind of annoying that they moved the attack button from X to O, although I imagine the final game will have button mapping. Combat feels a bit shallow, but hey, it’s a demo. As a standalone experience, FFXV Platinum would fall flat. But as a free sampling of what’s coming in September, it’s a delight. The demo might not be a graphical powerhouse—some of the textures are dull, and it feels unoptimized thanks to bugs and technical blemishes—but the environments are surreal and fun to explore. One minute you’re adventuring in the forest; shortly afterwards, Noctis has been miniaturized and must jump up furniture to escape a giant toyroom that feels like a cross between Honey I Shrunk the Kids and Kingdom Hearts. Panels scattered throughout the demo allow you to change the weather or speed up time so day will transform to night and vice versa. It’s less about giving you a standalone experience, like last year’s Episode Duscae demo, and more about offering glimpses of what’s to come. Once you beat the Iron Giant, you can step on a panel to fight a more challenging version of the iconic Final Fantasy creature. If you’re good enough, you can combo him to death without taking a hit, dancing around the screen as if you, too, are part of that old E3 trailer. 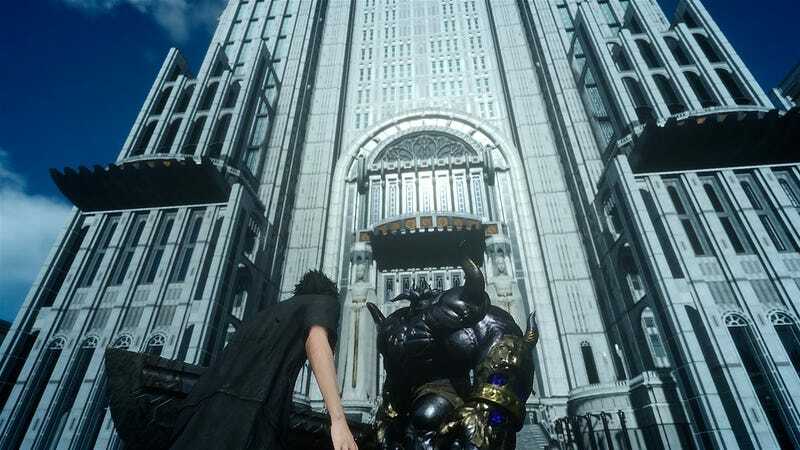 In September of 2014, I wrote about how important Final Fantasy XV is, not just for the future of Square Enix but for the climate of Japanese RPGs as a whole. For decades now, other JRPGs have followed in Final Fantasy’s stylish footsteps, no matter which way it’s walked. If Final Fantasy XV lives up to the potential its showed—that of a game with depth, with humor, with incredible music and characters whose motivations are tangled and interesting—we might be in for a grand new age soon. Let’s hope it can live up to what the Platinum demo has teased.